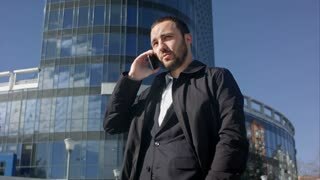 Young pretty business woman calling her friend using mobile phone and laughing while walking past a modern building. While Waiting for a Business Meeting /They communicate with each other. Mobile phones are in their hands. One of those businessmen excitedly walks down the hall and calling on the phone. modern youth. calm portrait of a laughing pretty girl.